Major management changes came in 1860. Wells Fargo & Co., which had loaned John Butterfield capital for starting the route, took over operations and forced Butterfield out. At the same time, the Pony Express began running mail across the Great Plains on a more direct, though riskier, route mostly following the old Overland and Mormon trails. In 1861, the advent of the Civil War forced Wells Fargo to end Butterfield service across the southern route. In March 1861, as southern states began seceding, Congress called for the overland mail operations to be moved to north. Wells Fargo moved all of its stock and coaches north, running its last stage along the Oxbow route on March 21 with full services ending in June as skirmishes and battles began taking place near the route through southern Missouri. The Battle of Wilson’s Creek, the first major battle west of the Mississippi, occurred on Aug. 10, 1861, directly on the Butterfield route, just southwest of Springfield, Missouri. To confuse matters, an overland stage company with no connection to the earlier Overland Mail Company, began operating between Atchison, Kansas, and Denver, Colorado, in 1865 that was named the Butterfield Overland Despatch. It was opened along the Smokey Hill River by David Butterfield, who had no relation to John Butterfield. 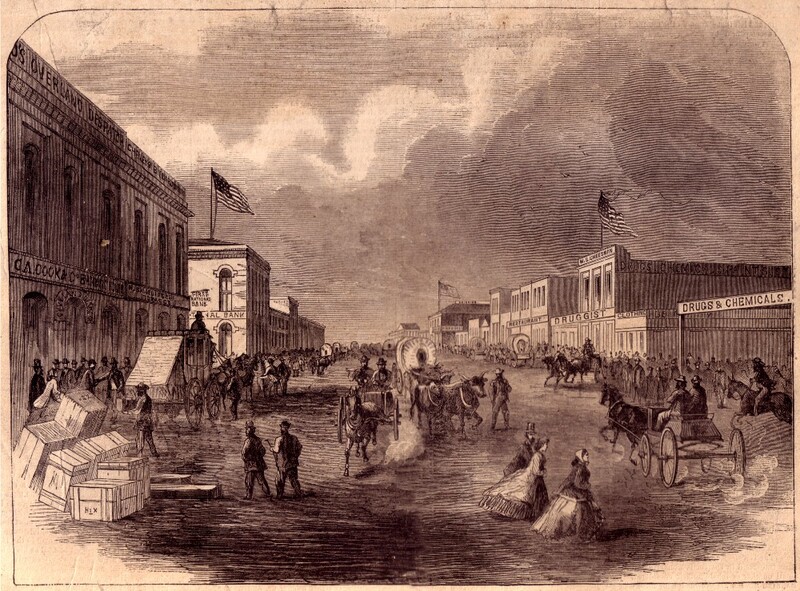 A stagecoach can be seen, left, in front of the Denver Butterfield Overland Despatch office at far left in this Harper’s Weekly illustration from 1866. On the main mail route, though, Wells Fargo held the contract for the western half of the route while Ben Holladay held the contract for the eastern end. The rates for Holladay’s company — Holladay Overland and Express Co. — were exorbitant compared to what Wells Fargo had been charging, and the two companies did not mesh well. In 1866, Holladay bought out the Butterfield Overland Despatch, and Wells Fargo bought out Holladay and operated the through route until the transcontinental railroad was finished in 1869.